No. 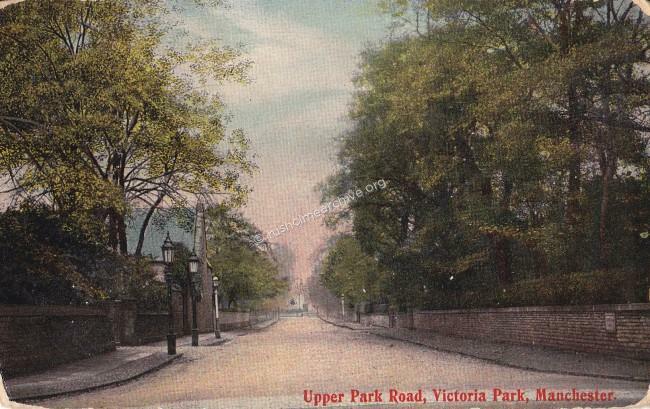 1, Upper Park Road, Victoria Park. Langdale, (the gaslight lanterns on the left are at the entrance), was built in 1846 for Edward Ryley Langworthy (1797- 1874). The name Ryley was the maiden name of his mother. Langdale, when first built, was set in 3 acres of grounds, with Lower Park Road, Denison Road and Upper Park Road surrounding the house. Born in London, Edward Langworthy worked in Central and Southern America before establishing a large cotton mill in 1840 at Greengate, Salford, with his brothers George and Lewis. It was apparently a large and successful business employing nearly a 1000 operatives. The mills were described by the Manchester Guardian, ‘as on a very extensive scale, regarded as a model of arrangement and often visited by distinguished foreigners’. The 1841 census records Edward Langworthy living in Victoria Park Crescent, (is this Crescent Gate, a few hundred yards from Langdale?). I have as yet not established when he was married but in 1841 he was employing two servants at this Victoria Park address. 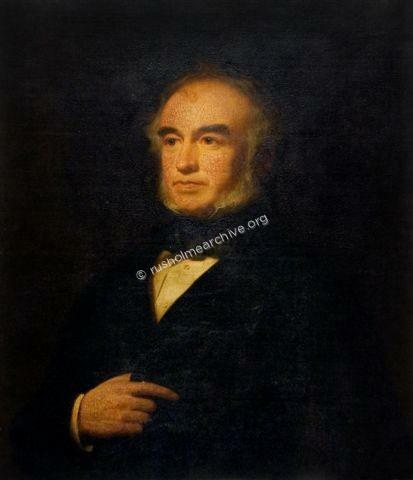 He was elected an Alderman in 1844 when Salford was given the status of a municipal borough and in 1848 he was elected the Mayor serving a second term during the ensuing year. It was during this second term that Salford Council acquired the Lark Hill estate and using the old mansion created the first ‘free’ public library and museum in the country. It is generally recognised that it was Alderman Langworthy who personally made a considerable effort himself and amongst his friends to raise funds and drive this project. During his lifetime he donated some £6000.00 to the Library & Museum. This particular benevolence was only part of his generally philanthropic nature, he made other generous donations to public & educational causes during the rest of his lifetime notably donating £10,00.00 to Manchester Grammar School, (he was a trustee and deputy chairman of the School Board). He was also a generous donor to Owens College, (later Manchester University). In 1851 Langworthy chaired a meeting of Rusholme gentlemen who felt the need for a public library and reading room in the village. They proceeded with the venture, initially renting rooms in Moor Street, but later in 1858, Langworthy as President of the Rusholme Reading Room and Library chaired the meeting that accepted a report that led to the construction of The Rusholme Library and Public Hall on Dickenson Road. The three most generous benefactors on the list of subscribers for the Library were Carrill Worsley of Platt Hall, Sir John Anson of Birch Hall and Edward Langworthy, each of them subscribing £100.00. 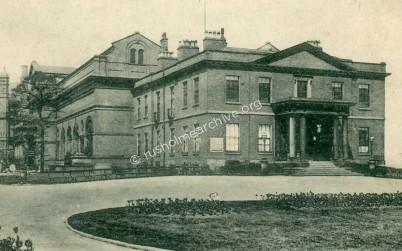 Photograph below is of Rusholme Library & Public Hall circa 1865. The corner-stone of the building for this newly-founded institution, was laid on Monday morning, by Mr. E. R. Langworthy, in the presence of a tolerably large number of persons, mostly of the working class. The site selected is on Great George-street, Chapel-street, Salford; and the land, with some buildings upon it, was given to the Committee by Mr. Langworthy, who has also contributed largely towards the funds, and been throughout most energetic in promoting the object. The building, which is to be altered so as to afford accommodation for the new institution, was formerly occupied as a school. It is 60 feet in length by 30feet in width, and one storey high, with a cellar. In the basement there will be four class-rooms. The ground floor will be occupied by a library, reading-room, committee-room, and a moderately sized class-room. Another storey will be added to the building and will be entirely occupied by a lecture room affording accommodation for about 400 persons. This is the room which will be at the disposal of the temperance society four nights a week. Presented to E. R. Langworthy, Esq. on the occasion of his laying the cornerstone of the Salford Athenaeum and Temperance Hall, by a few members of the committee, & as a small acknowledgement of his eminent services in the cause of education in Salford. February 7th, 1853. Mr. LANGWORTHY said; "It was with very great pleasure that he received the trowel, as a means of performing a part in the work in which he felt deeply interested. He congratulated the committee on their having so far advanced towards bringing their long and earnest labours to a conclusion; for he knew the difficulties they had encountered, and the disappointments they had suffered. The building they were met to commence was to be devoted to the furtherance and promotion of education and temperance, to the giving of assistance in self-improvement, and where all might have access to those means of instruction which he trusted, and could not doubt, would be beneficial to them. (Applause). To the rising generation, the institution must be productive of great advantages if they properly availed themselves of the means it would present to them. There would be class rooms for the instruction of the young, an excellent reading room containing various periodicals, and presenting the means of spending a useful and instructive evening; and it would also contain a library, the books in which might be circulated among the inhabitants of the neighbourhood". When Joseph Brotherton, (Salford’s first MP) died in January 1857 Edward Langworthy was selected 'by unanimous consent’ and was returned unopposed as the Liberal member of Parliament for Salford on February 2nd. . Following his election he gave a speech outlining his political views: he supported the temperance movement, free trade and civil and religious freedom, the reform of parliament, strengthened local government, but opposed any increase in the size of the country's armed forces. However it was a very short tenure, Lord Palmerston, the Prime Minister had failed to win a House of Commons vote of censure on the 21st March 1857, (the motion of censure being vigorously supported by a former Victoria Park resident and MP, Richard Cobden), and Parliament was dissolved. Edward Langworthy chose not to continue with a Parliamentary career but seemed content with his civic role in Salford. Edward Langworthy lived in Langdale with his wife Sarah. They had no children, but according to the census records between 1851 and 1891 had variously between 5 and 8 servants living in the house, additionally the groom & his family living in the coach house whilst a gardener who lived off the premises. There was usually a footman, cook and three maids, later as Sarah became rather older, (she died when she was 94) there was also two nursing sisters to help with her care. From the 1851 census onwards, Elizabeth Heaven, the sister of Sarah is also shown as living at Langdale. 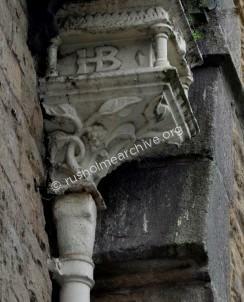 The architect of Langdale was Henry Bowman, noted both for his ecclesiastical work and as a architectural historian. He left his mark on Langdale in the form of his initials moulded onto the rain-water hopper as shown in the photograph below. The following notes about Henry Bowman and his partner Joseph Crowther are taken from Wikipedia. Among the churches Bowman designed are Hyde Chapel, Cheshire and Mill Hill Chapel, Leeds. He was joint author with James Hadfield of Ecclesiastical Architecture of Great Britain, from the Conquest to the Reformation, 1845; and with his partner, J. S. Crowther, of The Churches of the Middle Ages, 1857. Bowman and Crowther trained a number of younger architects, including Thomas Worthington, John Garrard Elgood, and possibly Edward Salomons. 'LANGDALE HALL Built 1846 for Edward Ryley Langworthy, a wealthy cotton merchant. Mayor of Salford, 1849, and instrumental in foundation of the Town's Public Library and Museum in that year. Mrs. Langworthy was noted for philanthropic work in Rusholme. Since 1911 the house has been a University Hall of Residence. Listing notes; Later C19, altered and slightly enlarged. Coursed dressed sandstone, fishscale slate roof. Double-pile plan. Gothic style. Two storeys and attic, 3 bays, with a narrow entrance bay between projecting gabled outer bays, 1:1:2 windows at 1st floor; plinth, bracketed eaves and barge-boarded gables (that to the left carved but the other replaced with plain boards, both with finials). The centre has an open porch with segmental-pointed central arch, moulded jambs, narrow side lights with ogee tracery and brattished parapet with blind trefoils; and a cross-window above. The projecting gables have large canted mullion-and-transom bay windows with*brattished parapets; the left has a 6-light mullion-and-transom window at 1st floor, with a hoodmould, and a small blank shield above with arched hoodmould; the right has 2 cross-windows at 1st floor, with linked hoodmoulds, and a mullioned 2-light attic window. Left return wall has added conservatory; right-hand return wall has added single-storey stone bay with canted corners, mullioned windows and brattished parapet, and beyond that a gabled wing projects. Former coach-house attached at right angles to rear corner, one-and-a-half storeys, with segmental-pointed entrance under C20 canopy, small gable dormer above, steeply-pitched fishscale slate roof, etc'. The two photographs below were taken in 2013. Sadly all of the carved Victorian bargeboard has been lost. 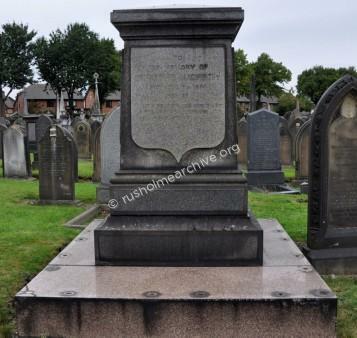 Edward Langworthy died on the 7th April 1874 and although the funeral at Brooklands Cemetery, Sale, was described as being strictly private, 500 boys from Manchester Grammar School attended the funeral. 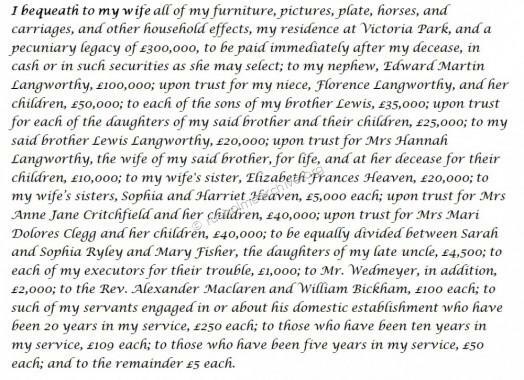 I have yet to determine his faith but I note that in his will he left £100.00 to the Rev. Alexander McLaren. He was the minister at the Baptist Union Chapel on Oxford Road; perhaps the Rev. McLaren presided at the funeral. His legacy to Salford City Council was also quite specific. Shortly after his death, Salford City Council decided to name a ‘new’ road, which was being built from Eccles Old Road (north) to Eccles New Road (south), after him, and subsequently, the Langworthy Hotel, the Langworthy Cinema (now gone) and Langworthy Park, each situated on Langworthy Road. The £10,000 that he left to Salford was used to build an extension to the Gallery & Museum that he had helped to establish during his term as Mayor. 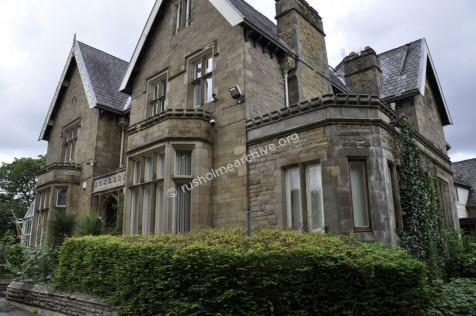 In the photograph below you can see in the foreground the mansion that was the original Gallery & Museum established in 1850, in the background and to left is the Langworthy wing built with funds from his legacy. The original mansion was demolished in the 1930’s as it was found to be unsafe. 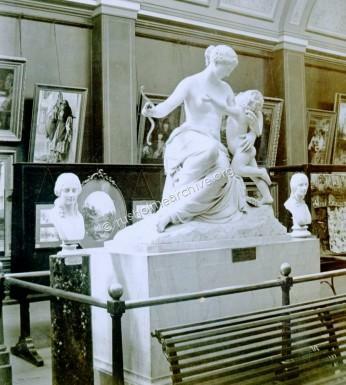 The two photographs below of the Langworthy Gallery interior are circa 1890 and taken from stereo-view originals. His legacy to the Owens College,(now the University of Manchester), was to establish a professorship in experimental physics; the following note is from the University of Manchester’s website and refers to the continuing value of the endowment. “Established in 1874, the academic post was created by a legacy gift of £10,000 to the Trustees of Owens College, which later became the Victoria University of Manchester. It was to endow a 'Professorship of Experimental Physics'. Within one generation the Professorship had its first Nobel laureate when Ernest Rutherford won the University's first Nobel Prize in Chemistry in 1908. Two more Langworthy Professors went on to win Nobel Prizes in Physics. The first was William Lawrence Bragg, who won in 1915. At 25 years of age Bragg remains the youngest Nobel laureate ever across all disciplines. Patrick Maynard Stuart Blackett, who succeeded Lawrence Bragg and held the Professorship between 1937 and 1953, won the Nobel Prize for Physics in 1948. Langworthy had a crystal clear vision for the purpose of his donation - he wanted the beneficiary to be committed to new discovery. To quote Langworthy from the original trust document: "It being my wish that students may be instructed in the method of experiment and research and that science may be advanced by original investigation." The University's long-term success in attracting outstanding individuals to do exactly that has far exceeded what even Langworthy could have hoped for. 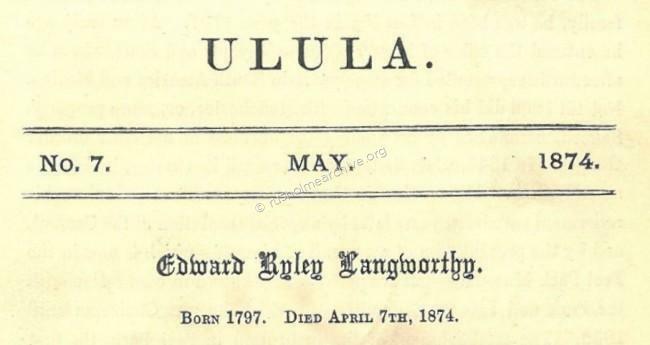 Manchester Grammar School founded a school magazine in 1873; called ULULA it published an obituary for Edward Langworthy in May 1874, the month following his death. OUR readers have doubtless noticed the introduction of a new name into that prayer in which we each morning make grateful mention of our founders and benefactors, nor will they have been at a loss to understand its insertion there. No name has a higher claim to stand by the side of Hugh Oldham’s than that of Edward Ryley Langworthy. Of our benefactors he was the most munificent; and, indeed, he might well be called our second founder; for the share which he took in the reconstruction of the School in 1870 was such as fully to earn that title. Of the presence and personal bearing of the man it is not ours to speak, for we were not privileged to know him; we can but give the bare outline of his life as it has been made public; and, in truth, his deeds tell more eloquently than any words of ours could do what manner of man he was. Mr. Langworthy was one of those too rare instances which from time to time give proof that mercantile pursuits and the acquisition of a large fortune do not necessarily deprive a man of sympathy with culture and the higher branches of education, as distinct from the merely useful acquirements required in the routine of business. The son of a London merchant, but sprung from a Somersetshire family, he was born in London in the year 1797. At an early age he entered the office of Messrs Charles Taylor and Sons, whom he afterwards represented for some years in South America and Mexico. Not till 1832 did his connection with Manchester, or, more properly, Salford, commence by his joining the business of his elder brother George. In 1844, when Salford first received its charter, he became an Alderman. His services in that capacity were recognized on his retirement seventeen years later by a special resolution of the Council, and by the presentation of a portrait of himself—which is now in the Peel Park Museum,—but are perhaps best known in connection with the Park and Library Committee, of which he was Chairman until 1858. The establishment of the institution in Peel Park, the first under Ewart’s Free Libraries Act, though due in the first instance to a proposal of Mr. Brotherton, M.P., was mainly carried out through the energy and munificence of Mr. Langworthy. His contributions to it are said to have reached £6,000. In this capacity it fell to his lot to revive many distinguished visitors, amongst others, at various times, the Prince Consort, the King of Portugal, Lord Stanley, Lord Palmerston, Lord John Russell, Dr. Wilberforce, and Mr. Gladstone. As a memorial of his share in the reception of Her Majesty the Queen in 1851 he presented the gates of the Victoria Arch. In 1848 and again in 1849 he was elected Mayor of Salford. In 1857, in deference to the general wish, he sacrificed his personal wish, and consented to represent the borough in Parliament. In less than two months, however, the general election, consequent upon Lord Palmerston’s defeat by Mr. Cobden with reference to the conduct of the Chinese war, gave him an opportunity, of which he gladly availed himself, to retire. Mr. Langworthy sat in the Liberal interest, but with the approbation and esteem of the Conservative party also. His death, at the age of 77, occurred at a very early hour on Tuesday morning, April 7th, after an illness of a few hours only. The cause was paralysis of the lungs. Mr Langworthy’s success in life was great, and his honours many and distinguished; but it is not for these that he will be best remembered, but for those acts of benevolence by which he has “ built himself an everlasting name.” Amongst these, we may mention his contributions to the funds of the Salford Dispensary, Salford Mechanics’ Institute, Owens College, and especially his munificence to our own School, of which he became Vice-Chairman of Trustees, August 22nd, 1840, and to which he gave, in land and money, £10,000. Nor was this all; for by his will he leaves it another £10,000, to be applied in the establishment of scholarships within the School. He also leaves a similar sum to Owens College, to found a chair of experimental physics, and to the Salford Royal Museum and Library. It only remains for us to remind our readers that though our presence there was, in a sense, the last act of respect and gratitude we could perform towards him who had done so much for us, there is still a duty—a duty of love—to be carried out, by which we may “ keep his memory green,” which is, so to use his benefits as he himself would have wished. If the good that he has done shall be “interred with his bones,”- the fault and the shame will be ours. Photo above is of Edward Langworthy’s monument at Sale Cemetery, he is buried there with his wife Sarah & sister-in-law Elizabeth. His widow Sarah continued to live at Langdale with her younger sister Elizabeth. Sarah had a reputation for giving to charitable causes, notably in Rusholme she made a substantial donation to the Rusholme Working Men’s Club in 1883. The following report from the Manchester Courier refers to the opening proceedings; the premises were opened by the Mayor of Manchester. 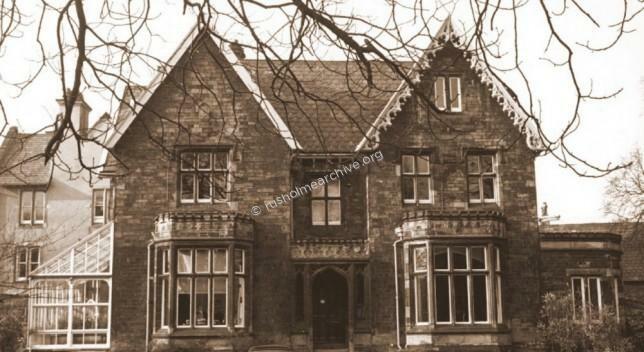 He was Alderman Philip Goldschmidt who lived nearby in Oldenburgh House on Wilmslow Road. 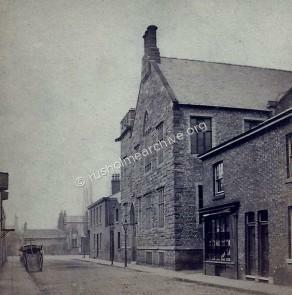 Rusholme Working Men’s Club, Nelson Street Rusholme, December 1883. “The Mayor, in declaring the club open, said the need for a larger and more commodious building had been felt for a long time, and he, somewhat rashly he was afraid, undertook to get them such a building,(Applause.) The first thing he did was to go to Mrs Langworthy, a lady who was always ready to help forward every good movement. She at once put into his hands a sum of money large enough to encourage him to go on with the scheme,(Applause.) He got other contributions, and though the total was not sufficient he went on with the building, thinking that by canvassing he would get what was necessary. He was mistaken in that, and a large amount was short. Mrs Langworthy, hearing of this, at once offered to make up the balance, (Applause.) So that he was now able, on behalf of the members, to hand over the building to the trustees free of debt,(Applause.) They were much indebted to Mrs Langworthy, and their thanks were also due to other friends, including Mr. Corbett, who had designed the building and superintended its erection, and Mr. Bateson Wood, who had transacted the necessary legal business, both gentlemen giving their services gratuitously, (Applause.) The Mayor concluded by calling for three cheers for Mrs Langworthy, which were heartily given. A splendid bouquet, subscribed for in small sums by the members of the club, was presented to Mrs. Langworthy". Elizabeth, Sarah's younger sister died four years later and her executors let the house in 1895 to a Manchester solicitor, George Fox. With his wife and two daughters they must have lived comfortably in Langdale, employing four servants in the house and a gardener living above the coach house. In 1910 the house was sold for use as a Hall of Residence and a new chapter began for Langdale Hall as it was to be known in the future. 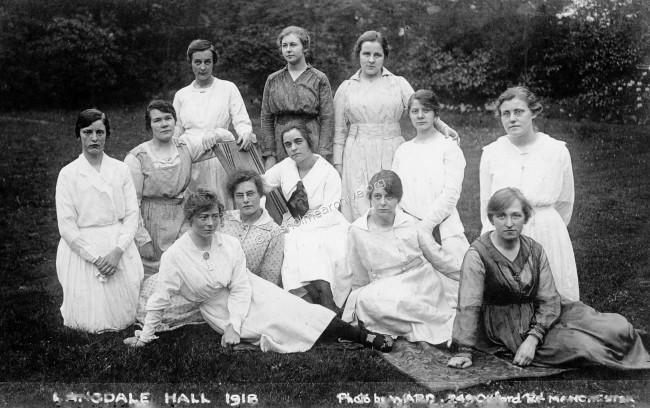 Langdale Hall was the second hall of residence in Manchester for women students. In 1904 a simple hostel was established on Oxford Road to accommodate woman students at the University. 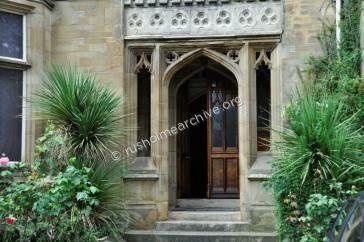 The hostel was governed by a Council that was represented both the Anglican Church and senior University academics. The Victoria Church Hostel, as it was originally known, aimed to provide accommodation for women who wished to become teachers in Church schools Although it only provided accommodation for a few students, the Hostel was licensed as a Hall of Residence by the Board of Education. Needing larger premises the Hostel purchased Langdale and moved into the house in the of autumn 1910. 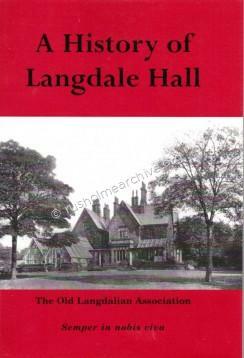 From the 4th December 1910 it became known as Langdale Hall. By 1912 the Hall had seventeen students and their daily routines included study circles and compulsory daily prayer. 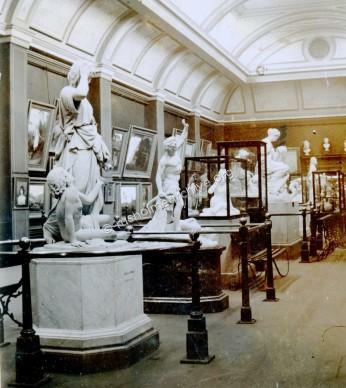 Plans for the first extension to the Hall were agreed in the spring of 1914 and, despite the effects of war, the new wing and large dining room were opened in January 1915. During the war the women staff and students of the Hall played their part, working in the hospitals and supply depots and on station duty when the trains of wounded men arrived from the Front. In order to alleviate the strains of wartime rationing, the staff and students began working in the garden to provide fresh vegetables. They were helped by boys from Manchester Grammar School with the digging and gradually the pleasant wilderness was turned into a real kitchen garden. “Rationing was still in full swing, porridge, Stork (1918 type) margarine, Cook’s Farm eggs (ugh!) and suet puddings were the order of the day. But a fine domestic staff (including ‘Bessie’) varied the menu as much as possible and our new lady gardener conjured loads of fresh vegetables out of the black soil where Hall extensions now stand”. “Wartime Manchester was strenuous indeed! The University women staff and students played their part to the best of their ability, filling up the gaps as more and more men departed, and doing their special bit, in the hospitals and supply depots, providing for Belgian refugees, and on station duty when the trains of wounded arrived from the Front. The hospital organisation of East Lancashire was one of the largest and most successful in the country and almost every night, ambulance trains arrived at Mayfield Station from the southern ports. This was an experience that later Langdale students will never know, and it is naturally the one that remains most deeply impressed in my mind”. In the photograph above, dated 1918, I imagine it was likely that amongst the students more than one might have lost a brother, perhaps a father, or certainly a cousin during the previous 4 years WW1 fighting. 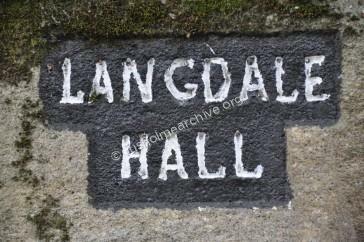 Langdale Hall served as a Hall of Residence for 92 years. During that time a number of extensions and changes were made. Notably in 1957 the Manchester Diocese relinquished responsibility for the Hall and the University of Manchester assumed the management. Perhaps the other notable event was in 1990 when the hall admitted male students. In 1920 the Old Langdalians Association was formed and this continued to provide former students with a continuing interest in the Hall, its staff and students. In 2002 the University decided that it was not an economical proposition to maintain the Hall and despite a great deal of protest from former staff and students the Hall was closed. The final role that the Old Langdalians performed was to publish a history of the Hall in 2002.There was a very short run of this publication but it does provide a very interesting review of the work of the Old Langdalians. Since 2002 Langdale has continued to provide accommodation to students, there being private management of the premises and students arranging their own catering in shared kitchens. In closing this page it might be appropriate to think that Edward Langworthy would have welcomed the use of Langdale as a home for students.